Products smells destructive ONA are composed of several very complex formulations offering a variety of chemical components with different features, both structural and chemical in terms of odor destruction . The ONA technology was created there at least 25 years. The engineers who invented the brand and the product ONA became speechless when they found that terpenes released into the environment, reduced odors and emissions of odors. The odors are not just hidden but definitely removed with ONA = Agent Odor Neutralizer. The result was a set of specialized formulations that neutralize a wide range of organic and inorganic odor problems throughout the use of the ONA product. The formulations ONA have been scientifically conceived and designed to be environmentally maximum possible, because for ONA respect the planet is important. ONA is manufactured under quality controls and are non-toxic to humans. Terpenes what is it ? Terpenes are widespread in nature, you know? Mainly in plants as constituents of essential oils . Many terpenes are hydrocarbons did you know? But there are also compounds containing oxygen such as alcohols, aldehydes or ketones ( terpenoids ). Did you know that their building block is the hydrocarbon isoprene, CH2 = C (CH 3) CH 2 CH = 1. ? The terpenes have properties anti-bacterial, anti-fungal and antiseptic . What are terpenes for oxygen ? The terpenes have properties oxygenating ( increases the level of oxygen ). Terpenes they destroy bacteria ? When released into the environment, it was found that terpenes reduced chemicals and bacteria suspended in the air. What are the characteristics of terpenes about smells ? The characteristics of terpene seem either to destroy the odor molecule, or to transform it into a more acceptable level. The active molecules in ONA will attract or get in touch with a low molecular weight or volatile compounds. These volatile compounds come in direct contact with the active ingredients of ONA to neutralize your bad smells or odors. This involves the permanent bonding of the odorous molecule, thus the volatile compounds and the active ingredients. The mechanism transforms the pollutant into its fundamental properties. Consequently, the smell disappears through agents ONA . Ona exudes an aroma of fresh air as a dessert apple ... To Crumble release . ONA is manufactured in Canada and work for the hydroponics industry since 1995 already. 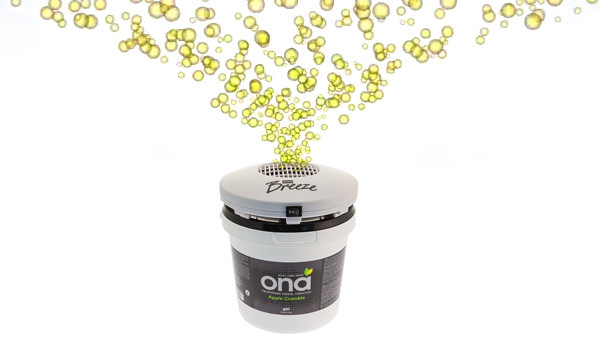 ONA destroys the powerful smells that are often generated in the hydroponic gardens . ONA has built its reputation as an effective odor neutralizer for hydroponics gardening industry because plants odors are sometimes very strong and fragrant. The indoor cultivation can cause strong odors and that can create problems for producers. To limit odors it is essential to use a product that attack and completely eliminates these odors as ONA neutralizer . The formulation ONA is designed to only let a fresh clean smell. Use ONA to food odors: ONA Gel, ONA liquid ONA mist, ONA Breeze use NAO for food warehouses to sometimes strong odors. ONA can also be used in the areas of meat and fruit. Discover the range of products ONA in Culture Indoor, the leader in hydroponics since 2002 in France and Europe. In a different concept for eliminating odors , discover the range The Neutralizer also on the shelves in indoor growing. If you prefer to invest in a system odor filtration without reloading constantly your cartridges and unnecessarily spend money Discover our radius active carbon filters and get the best results for the destruction of odors 100% finished stress . There are different carbon filter active and many brands for a good value, we advise HY-FILTER + carbon, or the most prestigious brand and best performing market carbon filter, try BULLFILTER and its coal Australian 100% pure virgin Bullfilter No. 1 in sales in France. Can not decide between ANO NEUTRALIZER and a carbon filter ? Choose among Culture Indoor, your grow shop to buy ONA at the best prices on the web, find a point of sale ONA among our 130 stores group Culture Indoor partner of your indoor crops since 2002. ONA relies on Culture Indoor as its official partner for distribution in France. Looking to buy products in large quantities ONA, Culture Indoor is your wholesaler for products of the ONA brand, please contact us site www.grossiste-hydroponique.com the French wholesaler for indoor growing or cultivation Hydroponic.